Facebook Messenger Uber carpools: This new update of Facebook Messenger is a welcome one. By using this update, you can able to ride on Uber taxi from one to another place on yourself and this update also provided the option to select x2 for you and your friend. It is not necessary to download Uber App if you are travel occasionally. Facebook Messenger will help you to travel one to one. This new update is not much difficult. This update allows you to share the route map details along with the booking information to your friend who will travel along with you. POOLx1 refers that the Uber ride for yourself and the POOLx2 refers that the Uber ride for you and your friend or partner. As we said already about the sharing option, it will also help you to pick up your friend or partner as on the way. Let see, if this update goes well or not. 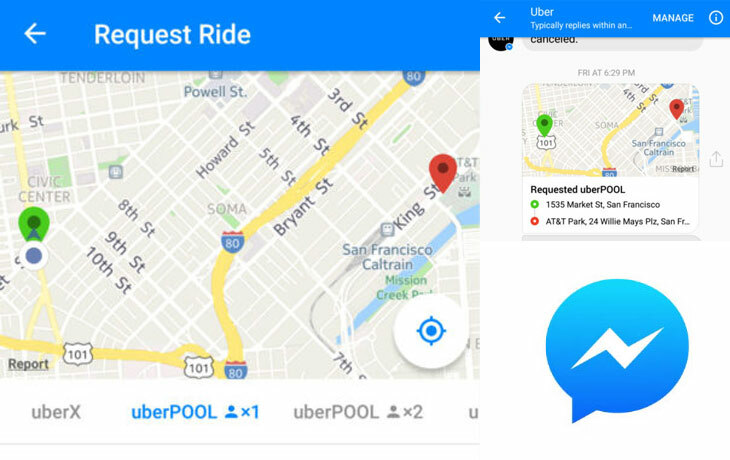 You can now book and share an UberPOOL ride from Messenger. In an open conversation, tap the car icon or More (three dots) and Request a Ride. You can select POOLx1 if you are requesting a ride just for yourself, or POOLx2 if you need two seats for you and a friend in your UberPOOL. This feature is available on Android and iOS devices, wherever Uber is available. Stay tuned for more Technology Updates and News!